The sharp, funny, and heartfelt follow-up to her bestselling Plan B, Anne Lamott's newest collection is a personal exploration of the faith and grace all around us. In Grace (Eventually): Thoughts on Faith, Lamott examines the ways we're caught in life's most daunting predicaments: love, mothering, work, politics, and maybe toughest of all, evolving from who we are to who we were meant to be. 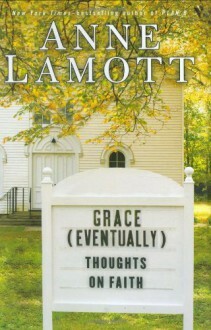 This is a complicated process for most of us, and Lamott turns her wit and honesty inward to describe her own intimate, bumpy, and unconventional road to grace and faith. "I wish grace and healing were more abracadabra kinds of things," she writes in one of her essays, "that delicate silver bells would ring to announce grace's arrival. But no, it's clog and slog and scootch, on the floor, in silence, in the dark." Whether she's writing about her unsuccessful efforts to get her money back from an obstinate carpet salesman, grappling with the tectonic shifts in her relationship with her son as he matures, trying to maintain her faith and humor during politically challenging times, or helping a close friend die with dignity, Lamott seeks out both the divinity and the humanity in herself and everything around her. Throughout these essays, she writes of her struggle to find the essence of her faith, which she uncovers in the unlikeliest places. By turns insightful and hilarious, pointed and poignant, Grace (Eventually) is Anne Lamott at her perceptive and irreverent best.